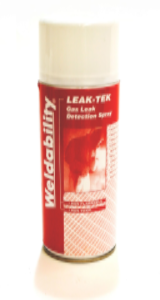 The Leak-Tek spray is an oil-free, non-toxic, milky spray, available in either a spray can or a trigger bottle. This product is non-flammable, non-corrosive, bio-degradable, environmentally friendly with no CFC’s and will not form combustible mixtures with other gases. In addition, the Leak Tek T trigger spray, is EN14291:2004 compliant and it’s non-corrosive formula eliminates cylinder nozzle degradation. To test, fill the pipes and spray the leak detector over the connections. If the spray bubbles, this indicates a leak in the equipment. When sprayed, it gives a low discharge milky liquid which all dried residue can be washed away by water. This product is not suitable for use with phosphorous or phosphorous compound gases, or on medical gases where ingress into the gas may occur.